Many people are choosing to live an off-grid life and with that, off-grid skills are certainly a must. One of the most important skills you need to have is how to start a fire, and sometimes most importantly, how to keep a fire going once it’s started. You can learn how to create a self-feeding fire that can burn for 14 hours or more. Even more impressive, this fire could last up to 14 hours or more even through the rain which is pretty incredible. Usually, outdoor fires can be hard to keep going for a really long time especially in the rain or high winds. If you’ve ever made an outdoor fire before you know that you need to monitor the fire closely and feed it air as well as more wood to have a nice continuous burn. Too much air and wet logs can be a hindrance to a good fire too, so there are things you need to keep away from the fire as well. This tutorial helps you learn how to keep a fire going without having to continuously feed it because it will be set up in a smart way that allows it to burn continuously. First of all, you place a few tall pieces of wood in the ground to support the logs for the fire. These pieces of wood are basically placed in the ground diagonally and then the logs are placed on them in a U or a V shape that is what helps this off-grid heating system work so well. So you’ll have to dig four holes to place four logs into. You’ll also want a shallow pit in the centre that the kindling will be placed into and that will keep some air circulating while the fire gets going. Dig two deep holes beside each other and then two more across from those holes. Then place two logs beside each other in those holes on a diagonal and fill in the dirt around them to stabilize them. Then add two more logs beside each other across from those logs on a diagonal to create a V with the other two logs. You can then place a couple of smaller logs or sticks on the underside of each of the large logs to brace them and hold them in place. This will ensure that they are sturdy enough to hold the logs that will create the fire. Once the burning logs are placed onto the support beams you will put small pieces of wood between the large logs to create air pockets in between them for airflow. The air is what helps to keep this fire going strong as fire uses air as fuel. So it’s crucial to have these little pockets for the fire to continue feeding itself. You can start the fire with dry grasses and plants which may take about 30 minutes to really get going so you must have patience when starting it. It’s also best to start the fire below the logs so it burns efficiently. You also create a clay barrier that will also help air to feed the fire. 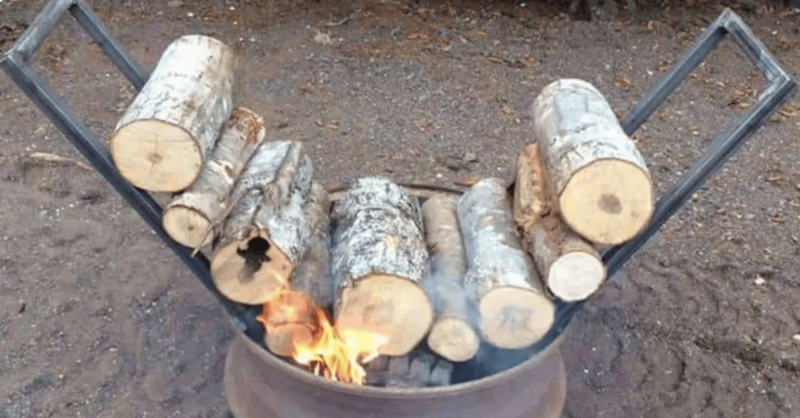 Try making this long-lasting fire yourself and see how it works out for you. Always be sure to watch the fire carefully as it burns and not to make it too close to any homes or buildings.